What I’m telling you is, even more ridiculous than all my drum and gong jibber-jabber is thinking that you’re gonna be getting laid at GonnaBang. Really, the only thing you’ll be banging at GonnaBang is your head against a wall. But why, Frankie? What’s wrong with GonnaBang.com? Well, you know I’d love to, but I can not, in good conscience, allow myself to disseminate this particular piece of information. El Sparko says that the sparkle will be sprinkled on GonnaBang with the shimmering scamtasy profiles called “Online Flirt”. We thank you, El Sparko. Truly, we thank you. But of course! Details coming up! What’s the first thing you should do when you’re thinking of signing up to a dating site? This quiz is easy. I’m just gonna tell you the answer. The first thing you should always do when you’re thinking of signing up to a dating site is read the terms and conditions. Why, you ask? Why should you read the terms? Because the terms and conditions are where you have a chance to find out if you’re about to get conned by signing up to a dating site. 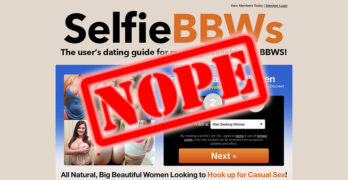 In order to cover their own asses, the terms are where the dating site discloses any shady things that they’re doing. And wouldn’t it be nice to know if a site is doing shifty stuff before you sign up and waste your time? I’ll tell you the answer to that question too. Yes. How about an example from the very site we’re talking about today? I.6. THIS SITE USES FANTASY PROFILES CALLED “ONLINE FLIRT®” In order to enhance your amusement experience, to stimulate you and others to use our Services more extensively, and to generally sprinkle some sparkle and excitement into the Services of GONNABANG.COM, we may post fictitious profiles, generate or respond to communications by means of automated programs or scripts that simulate or attempt to simulate your intercommunication with another real human being (though none really exists and any dialog is generated by programming), and we may employ or contract for the paid services of real persons who may interact with you as part of their compensated employment. Note the sparkles. So dumb. Fo’ real. Listen, when I say always read the terms first, I mean always. Do not skip this. Taking those few minutes to read through all that legal mumbo-jumbo can save you from a massive headache later. As is evidenced above, there’s more going on than meets the eye. But you need to have read the terms to know that. You’re just not gonna see the words “fictitious profiles” plastered on the home page of a site amongst all the roving boobies they’re using to try and reel you in. Sign up to a site without reading the terms? Not even once. You don’t have to believe me, but you should believe El Sparko. He exists in a glitter-filled world for the sole purpose of bringing you the truth. His raison d’être is to save you from getting scammed. He shows you the facts. Go on and re-read the words up there. Believe El Sparko. Believe in El Sparko.